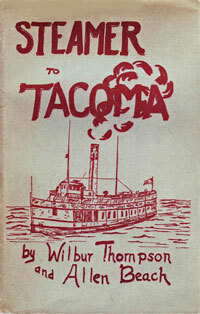 Wilbur Thompson is the co-author, with Allen Beach, of Steamer to Tacoma (1963). As the title implies, the book is a look back at a time when steamboats plied the Puget Sound. It includes specific details about the steamship Tacoma which served the 28 mile stretch between Seattle and Tacoma during the early part of the 19th century until 1930. The book's jacket says of its author: "If anyone is qualified to tell the story of the Seattle -Tacoma steamers, it is Wilbur Thompson. He grew up in the lore of their history. His uncle was Captain Everett B. Coffin who pioneered this run, beginning as mate on the Fleetwood in the late 1880s, and continuing on for more than forty years as master of the Flyer and the Tacoma. Wilbur Thompson himself served as purser on the Tacoma during the last years of his life." A copy of Steamer to Tacoma is available in the local authors collection of the Bainbridge Public Library.